This movie was a lot more hilarious than I expected it would be. Perhaps it’s because I walked in with extremely low expectations, because I had read so many bad reviews about it. Is the story cliché? Yes. Predictable? Absolutely. At certain points in the story, the plot seemed to be going all over the place. However, I thought the ending was perfect and adorable, which I thought pretty much made up for the rest. Whoever designed Turbo I think did a great job. He was a very cute snail. Paul Giamatti, who voiced Turbo’s older snail brother Chet, also did wonderfully and I found his voice acting to be pretty hilarious. 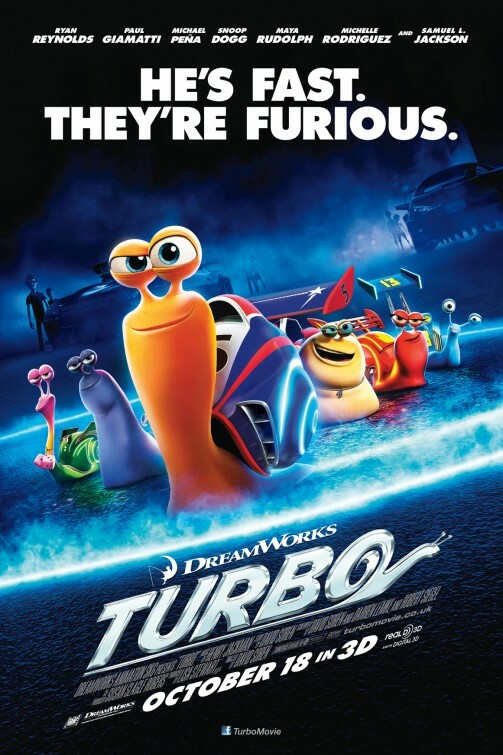 People have criticized Ryan Reynolds’ voice acting to leave something to be desired, but I think he did fine as Turbo. The kids and adults in the theater I was in were definitely laughing throughout the movie, which I thought was a good sign. I had my fair share of laughter as well. This is a movie I wouldn’t be surprised if kids would want to watch over and over again. The next animation that I think is coming out is Planes, but I’m probably not going to be seeing that one since I was never a huge fan of the Cars franchise. My next entry will either be on Matt Damon’s Elysium or trailers of movies I’m interested in watching, since I haven’t done one of those in a while. Until next time!